iheartblog: Summer Guest Post: Allie. Hello! My name is Allie and I am just thrilled to be posting on Wilna’s blog today! Today I want to share a little a bit about my scrapbooking process. I think I am in the minority when I say that scrapbooking for me is about the process and not preserving memories. When I scrapbook, it’s about a feeling or an emotion. I’m taking the time to create a layout about that subject (which, let’s be honest, is usually my husband or my dog) and thinking about them the entire time: How I can I build this page to highlight the subject, and the title to express a feeling for them or a special memory with them? 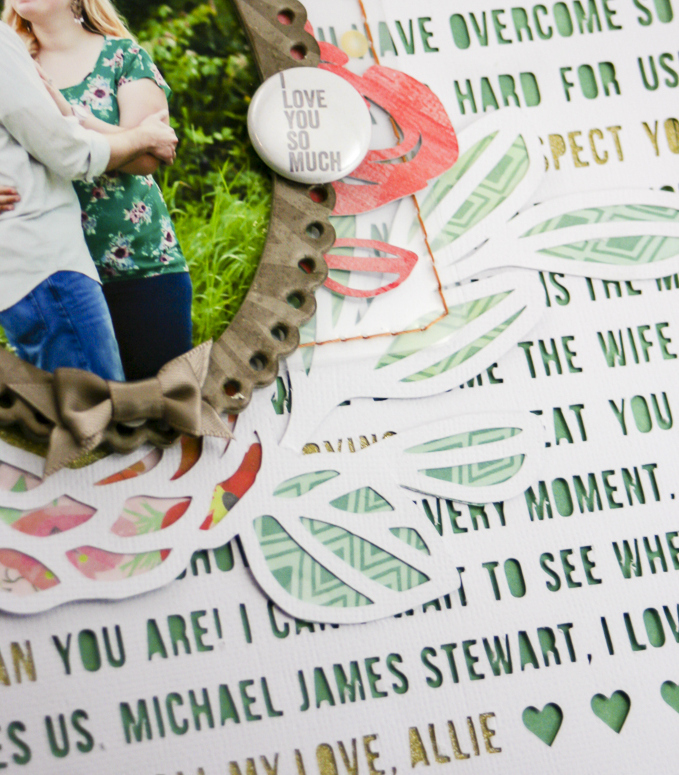 To me, a scrapbook layout is like a love letter to its subject. I decided to interpret this concept literally by making this layout an actual love letter to my husband. In order to do this, I used my Silhouette Studio software to type out a letter. I messed with the font, sizing, and placement until I was able to have it cover the entire background. I cut out the text on plain white cardstock (tip: make sure you have a fresh and clean blade when cutting lots of small text like this! I had a fairly new blade and still didn’t get the cleanest of cuts), emphasized a few lines with glitter paper, and backed it with a pattern that made the text readable and coordinated with my photo. I kept layering to a minimum because there was so much going on in the background, and I also wanted to keep as much of the letter as visible as possible. I used the Leaves and Roses cut file from the iheartstudio shop, and backed it with different patterned papers. I added a few embellishments, and the layout was complete! I did end up saving the text to a word.doc and printing it out so that my husband could see everything I wrote. Thank you so much for letting me share my layout and a bit about my process with you. I’d like to challenge you to create a project that expresses an emotion. This could be through a title, journaling, using the same concept I shared today, or anything else! Happy creating! I love your layout Allie - such a beautiful letter & a beautiful way to present it by making it a part of your design. Scrap lifting this idea for sure - just need to learn how to use my new Cameo so I can cut out all my designs from iHeart Studio! 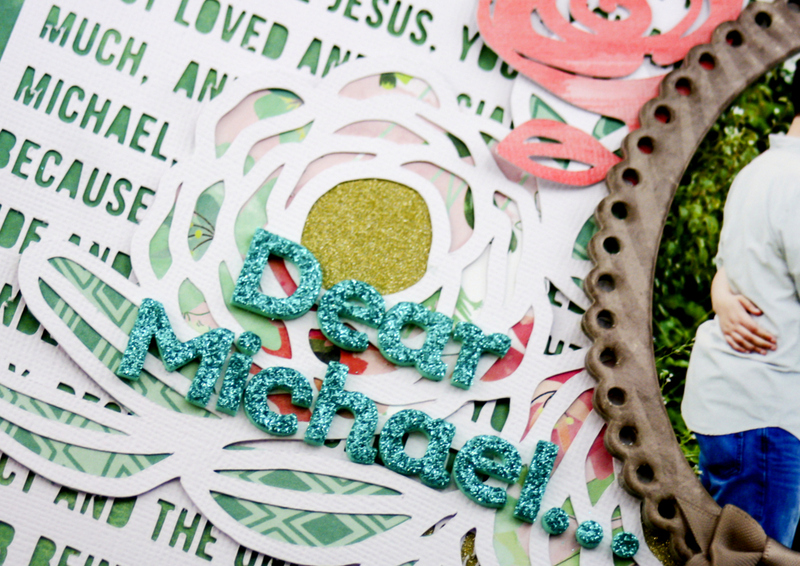 Allie, what a beautiful way to express your love for Michael! Great page. Gorgeous layout, Allie! Your are so creative and talented! Love this so much - you and Michael make a beautiful couple! You know I love your work Allie...but this one just touches my heart!!! Love this and the thought and care you put into your pages!!! Love how the cut file stands out with the papers behind it! Love your page! Congrats on your guest post, Allie!! Your layout is gorgeous! !